If you are familiar with Jane Mai already, you know that her comics are generally light-hearted and humorous with such telling titles as “Literal Poop Nightmare” and “Strippers.” For this reason it was briefly shocking to find the entirety of her full-length debut, Sunday in the Park with Boys, such a departure from what we have come to expect of her. Published recently by Koyama Press, this 52-page black and white volume begins by transporting the reader to Jane’s past. There we find melancholy and malaise tinged with a desperation that only comes from the awareness that time may be moving on without you. Read on and see how she combats existential crises, depression, loneliness, and the weight of existence; all the expected traumas of youth. She handles these hardships as you might imagine a twenty-something would, too – with a mixture of tears, forced toughness, and the repeated question of “why?” Why does no one understand? Why am I alone? Why am I this way? I was particularly taken by these vignettes into the life of Jane because they support the debunking of the oft-believed notion that just because someone is educated, successful, or otherwise privileged, they have no reason and no right to be depressed. This damaging train of thought might well be an undertone in this book, as Jane struggles to comprehend why she is having these feelings, and why no one can relate to them. The centipedes that continue to plague Jane throughout the book seem to be a metaphor for her depression, and they appear to both torment and comfort her. There are scenes in the book where it looks as though they are all she has left. As a writer, Jane is sparse in extrapolating on the emotions she is feeling from panel to panel, but as an artist she puts it all into the images. The saturated blacks and heavy brushwork invoke a dark haze perpetually surrounding her character, while the lack of text invites the reader to fill in the blanks with their own experience, to understand her. All at once she seems to both gloss over deep emotions as if they were nothing and yet get right to the heart of the matter. This book is a great find for anyone that has dealt with some of the issues addressed in this book, and even those who haven’t. The quiet resignation throughout most of the story lends itself to being a very real account of how these dark emotions manifested themselves for the author. 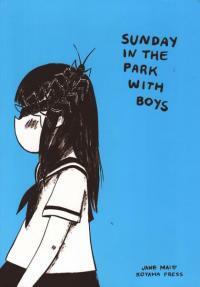 Nothing is contrived or trite, just an honest portrayal of a real girl with real feelings. A tale of what happens when a toilet overflows and ruins everything. ….one of those “you had to be there” moments I take it? Eew?